Oklahoma Historical Society officials unveiled the design rendering of the Oklahoma Museum of Popular Culture, a museum that will be constructed in Tulsa’s Arts District. The reveal of the “grit” and “glitz” design took place during a Monday morning news conference at the historic Cain’s Ballroom. Groundbreaking is expected to occur this fall for OKPOP, which will shine a spotlight on creative Oklahomans and their influence on popular culture. 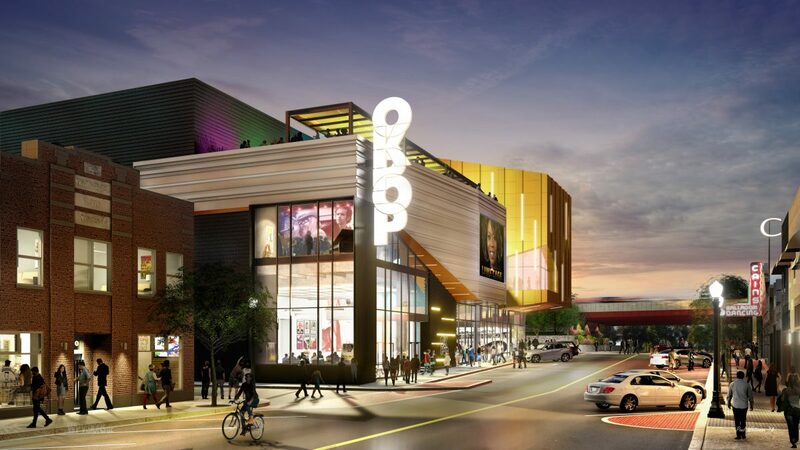 Some of those “creatives” were in attendance for the news conference, including actress Mary Kay Place, who returned to her hometown and introduced a short video that climaxed with an image of the OKPOP design rendering. The song that accompanied the video was “You Dropped A Bomb on Me,” a hit for a Tulsa-born group, the Gap Band, in 1982. OKPOP will be constructed across the street from Cain’s Ballroom at 422 N. Main St. Tulsa-based Lilly Architects and Overland Partners of San Antonio were selected for the design, which pays tribute — in a golden way — to Cain’s Ballroom, former home of Bob Wills and the Texas Playboys. Moore, saying a design was wanted that could reflect the story of OKPOP, told the crowd a tale about Wills and Leo Fender, a legendary inventor and manufacturer of musical instruments. Moore said Wills and the Texas Playboys road-tested Fender’s inventions. Appreciative, Fender presented Wills’ guitarist, Eldon Shamblin, with a gold custom-made Fender Stratocaster at Cain’s Ballroom in 1954. That guitar influenced the decision to use the color gold in OKPOP’s grit and glitz design. Best thing about the design? Moore and Lilly were among speakers during the news conference, which lasted about an hour. Other participants included Dr. Bob Blackburn, executive director of the Oklahoma Historical Society; Ray Hoyt, president of VisitTulsa; Mike Neal, president and CEO of Tulsa Regional Chamber; City Councilor Blake Ewing; Shane Fernandez, president of Nabholz Construction; and Tom Blonkvist and Michael Ray of Overland Partners. Nabholz Construction will bring the design to life on the property (estimated value $1 million, according to a news release) donated by Tulsan David Sharp and Interak Corp.
Blackburn, who thanked Sharp and others who have supported the OKPOP venture, said the idea of the museum was launched with a presentation in 2008. “We got this crazy idea of building a new museum at a time when the state was suffering financially,” Blackburn said, adding that you have to seize opportunities for betterment. He expressed confidence that OKPOP is an investment that will bring a return. OKPOP’s staff is collecting artifacts, photographs, archival materials, film, video and audio recordings that represent Oklahoma’s creative history. Some of the famous Oklahomans OKPOP will feature include Wills, Will Rogers, Joan Crawford, Gene Autry, Leon Russell, Reba McEntire, S.E. Hinton, Garth Brooks, Wes Studi, Alfre Woodard, James Marsden, Carrie Underwood and Kristin Chenoweth, among many others. Blonkvist said the design process was guided by paradoxes and surprises. “Because pop culture itself reflects the trends of its time, the primary challenge for our team was to create a space that is both current and timeless, both popular and cultured,” he said. The structure was designed to house a living experience that includes event venues, stages and retail space. Mostly, it will tell the story of Oklahomans. “We’re a pretty new state in the grand scheme of things,” Ewing said, indicating that Oklahoma was founded with a land run and an oil boom. He said people came from all over the world to blaze a new trail and that spirit is responsible for the talented Oklahomans who continue to produce in the arts world. Moore said there is still a lot of work to do.